I’m playing at the Cambridge Folk Club on March 29th with Portland Brothers (that’s me and Tim Victor). You can get tickets here. We’re making an album, meeting up every few weeks and writing and recording and we’re looking forward to earning our folk club stripes. I’ll be announcing some solo shows in early April soon as well. Two more shows from the French Drops this year, in Cambridge and London. Time/logistics/geography prevent us from getting together as much as we’d like, but we’re going to try to make another record before next Spring. Non-Drops news: I’ve been working on some songs with my old friend Timothy Victor, and we’re about to start playing them at people in public. Our first show is in Leytonstone and we’re called Portland Brothers. Are you kidding? Of course we’re excited about it, it’s a new thing! Virtue Signals is out now. You can get it here, or wherever you get music. a fine, bassy bear of a man. The cover painting is by Tom Leamon. We played a few shows and we’ll play some more. 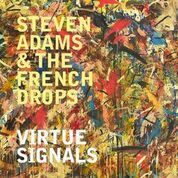 FREE WILL is taken from our album VIRTUE SIGNALS out on May 4th on HUDSON RECORDS, available to order now. We have an album coming soon. It’s called VIRTUE SIGNALS. >>>>Here’s the first song off of of of it. BAD APPLES.